This from the Medina Tribune, Thursday, 17 April 1924: "On Saturday morning at 11 o'clock Albert L Swett, one of Medina's foremost citizens passed away at his home on West Center Street, as the result of an automobile accident near Middleport last fall. "Among the pioneers of Western New York from the New England states were the parents of Albert L. SWETT. His father was Joel R. and his mother Minerva F. (BATES) SWETT, and they settled in Orleans county, town of Ridgeway, in the year 1825. Here Mr. SWETT was born April 27, 1850. In 1856 his parents removed to Champaign, ILL. Mr. SWETT had the advantage of common school attendance in the winters, working on the farm summers. When the Civil War broke out his father and his older brother, Joel B. SWETT enlisted in the army, leaving the mother and four children at home to carry on the farm work. Albert L. was the eldest of the four and he was only eleven. At the close of the war, when Albert was fifteen years of age the family returned to Medina. His first occupation was that of a grocery clerk, remaining two years in this position, and then taking a course in the Medina Academy under Professor Charles Fairman. Following this he entered the employ of the Bignall Manufacturing Company, beginning as a helper. He studied the business and the interests of his employers and soon received promotion as order and shipping clerk This position he filled seven years, during which period he had by economy saved about $1,200. With this modest capital and ample determination and experience he associated himself with W. H. Samson, organizing under the firm style of the Medina Manufacturing Company, for the purpose of manufacturing hardware specialties. At the end of seven years they purchased land on the north side of Medina, on Oak Orchard creek, erected a dam which supplied good water power, and built one of the finest manufacturing plants in the state. In 1889 Mr. Swett bought the entire interest in the business and has conducted the same since. The plant regularly gives employment to over 300 men. "Directs Power Company. The A. L. Swett Electric Light & Power Company, which was later changed to the Western New York Utilities Company, and the interests of which Mr. SWETT has disposed of within the past year furnishes not only light and power for Medina, but surrounding towns, including Middleport, Lyndonville, Shelby, Waterport and many others. This dam and the power which generates therefrom has been the upbuilding of Medina, all the keen foresight, tireless energy and abundance of resource of Albert L. Swett. In 1920 he began the construction of this immense dam which spans the creek bed from bank to bank, a distance of 600 feet. West of this main dam extends a dike 1,600 feet long, making a total length of 2,200 feet. An inland lake, one and on-half (one-half) mile long and nearly fifty feet deep having a surface of over 150 acres, is formed by this dam and dike. "Mr. SWETT was married in 1872 to Lucinda M. FULLER, and they have two children, Charles S. and Raymond F. both of this place. Besides his widow and two sons he is survived by one sister, Dr. Emily F. SWETT, of this place, and Rev. Lyman SWETT, of Boston, Mass. Mr. SWETT was a member of the First Baptist Church of this place, a most loyal supporter of the Boy's Community Work, Medina Hospital, having contributed $10,000 to the new building fund, and the foreign missions, particularly those of India. "The funeral was held from his late home on Tuesday afternoon, at 3 o'clock and was very largely attended. Rev. M. E. VanNostrand of Albany a former pastor of the Baptist Church, officiated, assisted by Rev. J. J. Allen. The remains were placed in the vault at Boxwood cemetery and will later be buried in the family plot. The honory (honorary) bearers were: General J. S. Thompson, Mayor C. H. Pettis, Watson F. Barry, W. L. Bennett, G. A. Newell and A. G. Phillips. The bearers were G. A. Bowen, Erwin Rands, R. H. Newell, Albert Broughton, Glenn Ide and B. Edward Slack. Among those from out of town attending were: William A. Rogers, President and Founder of the Rogers Brown Co., and Mr. Shephard of Buffalo, Mrs. J. C Foley and Miss Royce of Brooklyn; Rev. and Mrs. Lyman SWETT of Boston; Mr. and Mrs. E. F. Hersey, of Hingham, Mass; Mr. and Mrs. Jay Thorpe, Mrs. J B. SWETT, Mrs. A. M. Cragg and Clayton Daly of Rochester and Mr. and Mrs. Fred Mills of Batavia." Albert Louis Swett (1850-1924) was recorded in the U. S. Census of 1870, age 20, living with his father, Joel R. Swett, a carpenter, his mother, Minerva Swett, and 5 siblings in Medina, town of Shelby, Orleans County, N. Y. His occupation is "works in furnace." Ten years later, in 1880, he lived at 12 Center St., Medina, N. Y. With him were his wife, Lucinda, and two children, Alice A, age 6, and Charles, age 1. The A. L. Swett Iron Works were created in 1889, when Swett bought out his previous partnership with William H. Samson (known as the Medina Manufacturing Co. and as Samson & Swett, 1873-1889). In 1897 Swett began supplying electricity to the village of Medina, and formed the A. L. Swett Electric Light and Power Co. According to the Genealogical and Family History of Western New York, by William Richard Cutter (1912), Swett "erected a modern electrical plant at Medina Falls, where a fall of some thirty feet made it possible to develop about four hundred horse-power. In course of time this plant also became too small, and in 1903 the company began to build a large dam one mile north of Medina, on Oak Orchard creek, which would back the water up stream for nearly a mile. This dam gives fifty-five feet head and furnishes power for three eight-hundred horse-power units." This aspect of Swett's business eventually evolved into the Western New York Utilities Co. (1916). The 1921 Orleans County Directory lists the A. L. Swett Iron Works at 145 Glenwood Ave., Medina, and Western New York Utilities Co. at 528 Main St., Medina. An advertisement for the A. L. Swett Iron Works appeared on page 50 in Carpentry and Building, vol. 27, Jan. 1905. During the period 1890 to 1898 Albert Swett secured several patents for his inventions relating to barn doors and such. An example is this door hanger from 1890. 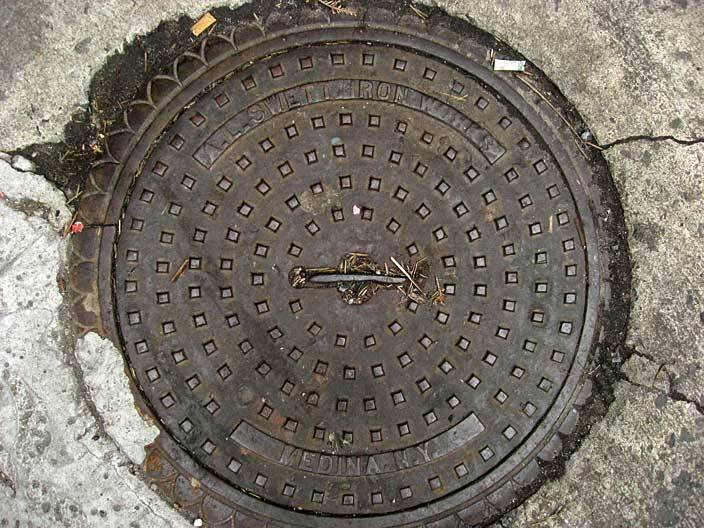 Another A. L. Swett coal chute cover is found on Morton St. in the West Village.